May 11, 2017 – What a great night last night with a fun group of women. I have serious workshop envy with the shop we painted in last night. Full bar, huge sinks, bathroom, lots of space, tables, you name it, it was there. The items brought in to paint were unique and it was fun to see the ideas ffor the pieces forming and final projects. We may be doing a repeat here this summer. See the ratchet piece under the top. This table adjusts in height. Very clever. Painted with Missouri Limestone Paint Company “Clothesline” and then distressed, it is beautiful! This was a family heirloom that needed a new look. Painted with Missouri Limestone Paint Company “January” and “Cupboard Green” then distressed, it will look great in a farmhouse styled space. This unusual piece is an antique plant stand of some kind. Just one coat of Missouri Limestone Paint Company Rural America brought out the wood grain beautifully. A little more distressing and wax – it is now a stunning piece of art. This table base is painted with Missouri Limestone Paint Company “Grannie’s Lace” and is now waiting for a new table top. Spirals Art Gallery & Studio: Cuba, MO – next class is scheduled for September 17, 2016. Click on the Spirals link to learn more! Our 1st of many DIY chalk painting classes was a success! Sharon and Danny Sumner of SharSum Paint gave a great classroom lecture and then we all turned to the studio for hands on painting. 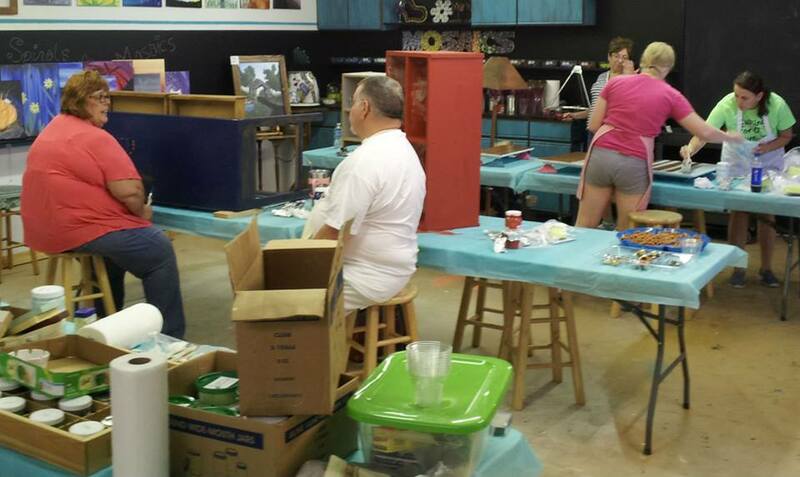 The group painted everything from kitchen cabinet doors, a desk, and cubby, to tv stand, floor lamps and shades! 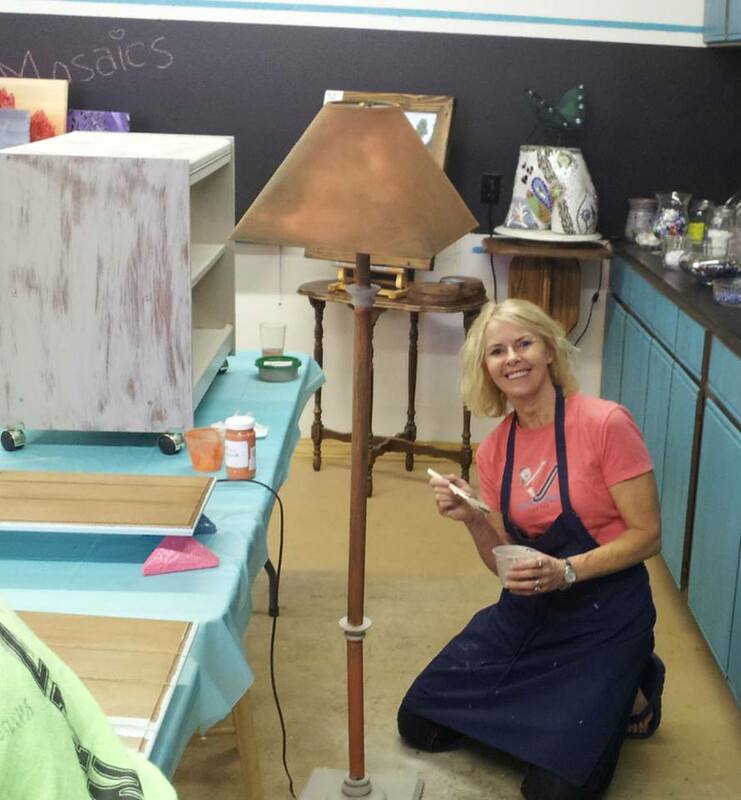 SharSum Paint’s First Make & Take It Class was Fun! 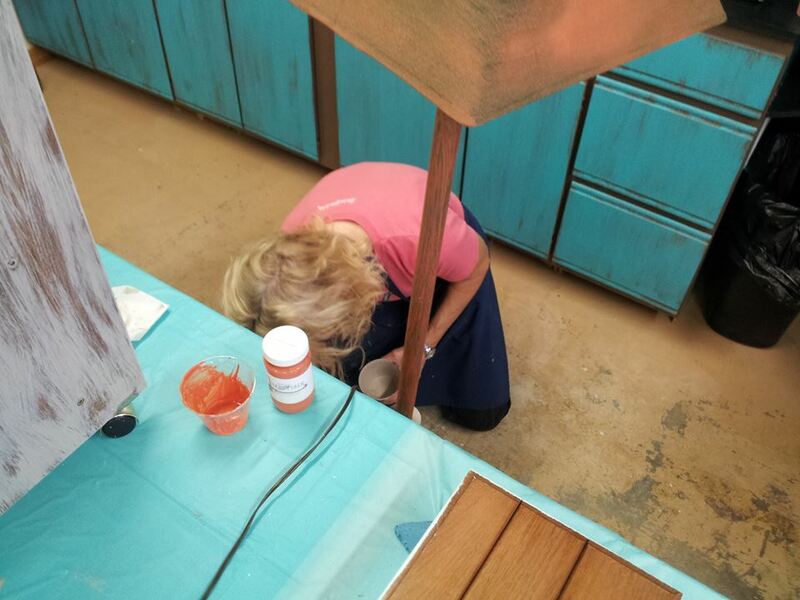 SharSum Paint conducted their first class, November 2015, in a friend’s awesome shop area at her home. 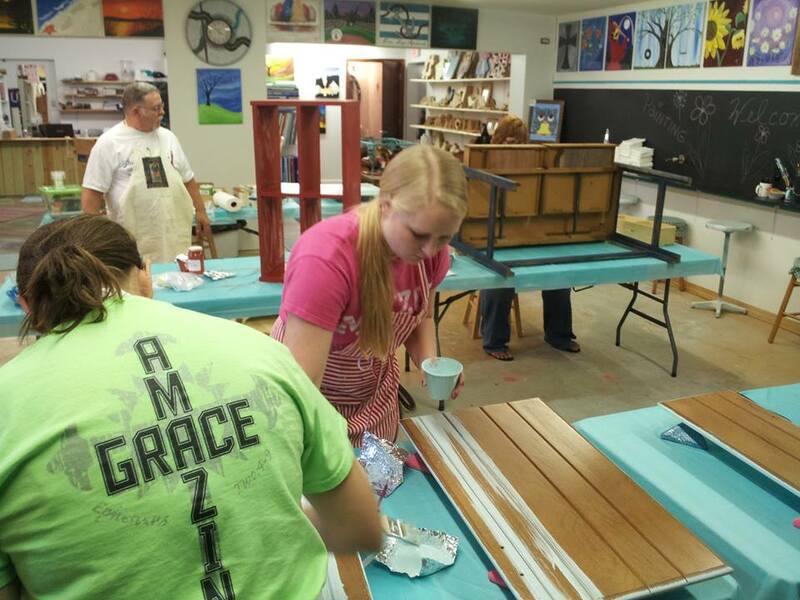 Nine “students” were there and had a great time learning more about chalk-based painting and actually painting a project they brought. They had so much fun, they are ready to attend another in January. In January, we will explore more with waxing and distressing techniques. We will also be conducting classes at Gift Emporium in Sullivan. We will plan on starting these classes around noon, so be sure to bring not only a project to paint, but an appetite, too. Class sizes are limited to no more than 6-8. Please check the Painting Classes link on our website menu for the next class. 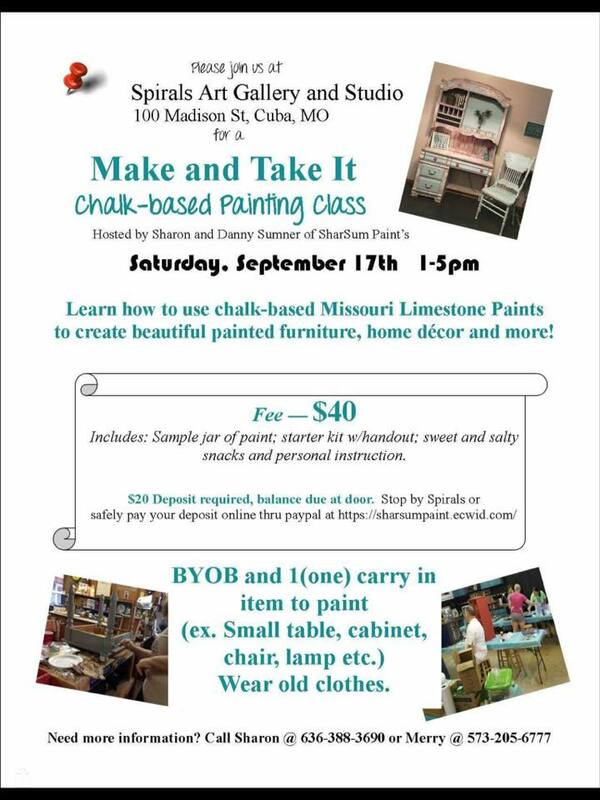 Are you interested in hosting a painting class party in an area of your home with you and your friends? In winter, do you have a heated garage or a basement just crying out for a paint party? We can paint just about anywhere so you can be the judge on the best place and the number of friends (no more than 10). Contact SharSum Paint (sharsumpaint@gmail.com) for more details. The biggest lesson to learn when first painting with chalk-based paint is paint in thin coats. This will help your paint dry quicker and make a nice smooth chalk like finish. The projects for our first class didn’t have time to dry enough for waxing, but as soon as they have waxed their projects and sent pictures of them, I will post their finished projects here. For the next class, we will have hair dryers available for speeding up the drying process. And remember, apply chalk-based paint in thin coats. This process is different than trying to cover an area in one coat. You may need several coats, but the end result will be beautiful. In the meantime, enjoy seeing this first group’s re-purposed objects come to life in the beautiful colors offered by Missouri Limestone Paint. A Vintage Games Table Restored – Could it be Federal?